How would you define an RPG? Well, there are certain fundamental elements, such as a particular worldview, the story, movie sequences, and characters. The essential elements are characters with real individuality and a unique worldview. When these two elements are fused and form the twin peaks of a high mountain, well, I think that’s my concept of an RPG. In the Square era, I would often say: ‘I’m going to make an interactive movie!’ To be honest, I now feel differently about that. I’m trying to maintain those twin mountain peaks, but at the same time, take the RPG to places it’s never been before. But looking back, you made the FF movie12 and then the online game was developed. I think they left a really significant legacy. I genuinely think that the know-how developed back then has left its mark on the culture and opened up new paths for us all. 12Final Fantasy: The Spirits Within was a computer-animated film released in 2001. 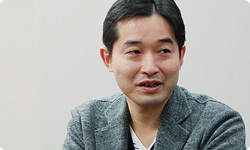 It was directed by Hironobu Sakaguchi. A film will always end at a specific, defined time. But games will continue for as long as you wish to play them. You won’t finish them unless you put in the effort, and for some reason this enhances the depth of the experience and makes the game resonate more with the player. I’m always looking for new ways to excite players, trying to find out what it is that really gets them to immerse themselves in a gameworld. RPGs are where players can really project themselves into the world of the game, whereas games like Mario are where the experience points are built up in your fingertips. We often treat them as being very different, but I think they’re essentially the same thing. 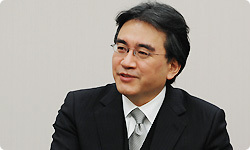 In terms of adding unique flavour to those games, the two of you have specific things you are good at, whereas Miyamoto-san, for example, has others. This is what gives games their separate tone or style. I do have a sense that in the field of RPGs, the programming side of things has been somewhat neglected. I think there was a period when that was the case. The priority was to impress people with beautiful graphics, and the programming side of things may have been side-lined. But I do think at the same time that it’s a great time for RPGs. At this stage, those of us making RPGs are more aware of the problems that will present themselves, which makes things easier, and it’s still challenging and stimulating to make those games. I see. Now, to conclude the interview, I’d like to ask you both about how you envisage video games developing in the future. Sure. Well, this time round I combined different ideas and tried out various approaches, and I came to this conclusion: developing a game is like filling a lake one drop at a time. But I think that if you imagine that water dripping from a cloth, wringing the cloth will get those drops to fall thick and fast. With entertainment, there is no set answer, no set, defined way games should be made. With developments like the Internet, the number of methods you can take advantage of for games has increased, and these games aren’t made by a single person. So if you imagine a group of people all grouping together to wring out that cloth, it can lead to interesting results when there is no drop left. So, all the developers are sharing the same common feeling about the main pillar, but if each one of them adds their ideas to the mix little by little, it could grow into something really rich and appealing. I think it’s really important to build an environment conducive to working in this way. 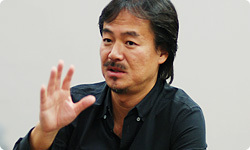 With the games you make, Sakaguchi-san, I think a central pillar is that element, which people in general are not conscious of in that regard. Yes, I would say so. This time in particular, while it was hard, we really managed to enjoy the process and the overall atmosphere was extremely good. And how about you, Takahashi-san? For this title, we defined all the elements needed for an RPG, calculated the productivity required from each member of the staff and collected data indicating precisely how long the process took. Yes. My aim was to prepare myself properly for the next time I need to step up and take on the world. In the future, we can build on that basis, though of course you always need to come up with new ideas too. My plan was to see more clearly how we could make a product using the particular skills and talents at our disposal. Not that I have yet reached a final conclusion. I see. But what do you mean by stepping up and taking on the world? Do you mean in the sense of games created in Japan being successful worldwide? Well, games like Mario and Zelda have been embraced by the whole world. But with RPGs it’s not so easy. Yes, from a certain point, it did become tougher. Do you mean one of the reasons is that creators tended to overuse the same approach? I think so. I’m not sure if this is the best way to put it, but America and Europe were once slightly behind Japan in game development, but now the drive for innovation has meant that developers there have sped up rapidly and overtaken us. So the way games are played changed, leaving the old ways behind. Right. 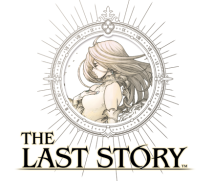 I feel that Japanese RPGs have been left behind. That’s precisely why RPGs have no choice but to change. So then the question becomes one of deciding which elements to change, and which to keep the same. But having said that, I do firmly believe that Japan still leads the world in terms of the fine detail in the games, and in rendering emotional depth. I think if we stay true to this, Japanese RPGs will still be able to hold their own on the global stage. This is an issue that worries us all. Also, we’ve spoken of the concept of empathy and resonance. Well, when watching foreign films, we feel that same empathy. There may be elements of other cultures that are unfamiliar to us, but if that emotional resonance is present, then I think these differences can be bridged. That’s why there are things I am relatively optimistic about. There’s no doubt that there are things that resonate with people no matter where they come from. But I don’t think there are that many people out there who are able to build on this effectively and consistently. This is one of the problems that those of us in Japan who are developing games will have to overcome. Although games are a form of entertainment, there are too many occasions where we start making games with the premise that we will not change things. The typical example of what isn’t changing is the organisational structure. Structures don’t tend to change unless something really goes seriously wrong. When an organisation is running smoothly, it can often become stuck in its ways. In fact, the whole existing structure needs to be scrapped and the way that games are made itself needs to be remade and remodelled. I don’t think it would be easy to scrap it, but I think that this organisational structure probably needs to change. Rather than just demolishing it all at once, it needs to be steadily overhauled, scrapping parts and remodelling them. I like to compare it to repairing an aeroplane while it is in mid-air. Ah, that’s a very good way of putting it. Trying to replace an aeroplane part while it is flying is an extremely delicate operation. But something that brave and that precise is probably what’s needed. When I speak to you both, I really get the sense that there is still a lot that Japanese games can achieve. I look forward to seeing you taking on the world soon. Thank you very much for joining me today.